We all have a general understanding and awareness of architecture. It is something that surrounds us from the day we are born, until the day we pass on. But do we know the origins of it? Today we want to explore the beginnings of a topic that many people may not even consider. Even though it was the basis for the room you’re sitting in reading this in right now. Architecture is the art and technique of designing and building as distinguished from the skills associated with constructions. – Alan Gowans, Rodger Scruton, James Ackerman for Encyclopaedia Britannica. Okay, so what does it provide? The practice of architecture is employed to fulfil both practical and expressive requirements, and thus is serves both utilitarian and aesthetic ends. – Alan Gowans, Rodger Scruton, James Ackerman for Encyclopaedia Britannica. Architecture differs from build structures because architecture aims to meet a number of criteria. This includes the suitability of the work for human occupants, the stability and durability of the structure and finally, the experience and idea’s portrayed through the form and design. Now that we understand the difference between architecture and structure, lets explore the first example of architecture. 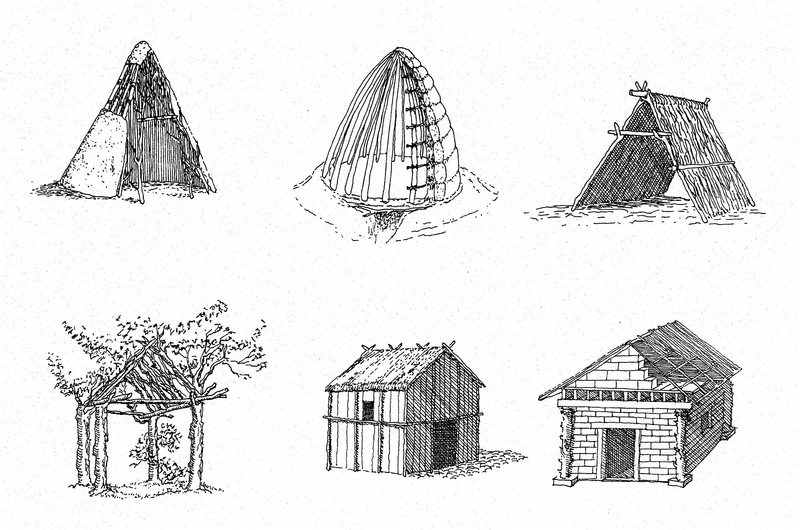 The primitive hut is a concept which explores the beginnings of architecture. The relationship of human and the environment is studied to determine the basis of architecture. This concept can be read about in The Essay on Architecture by Marc-Antoine Laugier. To quickly summarise, the hut is a historical object which demonstrates man’s understanding and need for protection from natural elements. This also reiterates Laugier’s argument that nature dictates architecture. The hut, a simple construction, provided protection from wind, rain sun etc. It acted as a base for the family, a place to sleep, gather and survive. It is from this point that the consideration of construction and architecture evolved. The core values and requirements were defined by the needs set by the primitive hut and the inhabitants. Meaning, the considered origins of architecture. In the next blog within this series, we will explore the next step in the timeline for architecture. As we progress, we will learn about the individual characteristics and iconic structures which shaped and progressed architecture as we know it defined today. For more information on architecture, see our previous blogs. To speak with our director and principal architect about your contribution to the architecture timeline, contact us today.